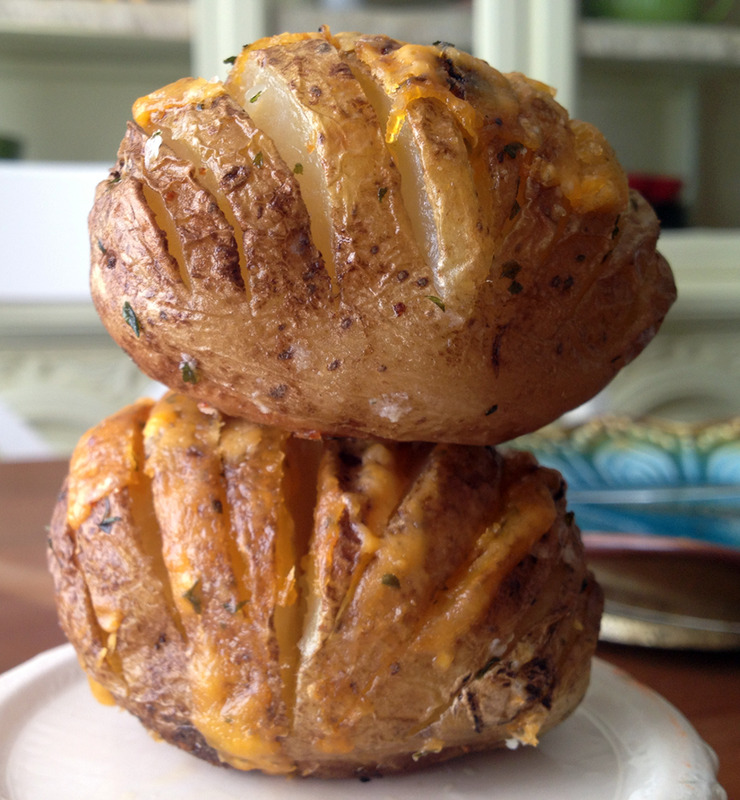 One of my favourite dishes is baked potatoes, often stuffed or topped with cheese. I often use cheese sauces in potato recipes as an alternative to just topping potato pies with cheese or adding cheese to the potato. This recipe uses potato as one of the main ingredient for the cheese sauce instead of using flour and is specific to making ‘potato cheese and onion sauce’ for stuffing the baked potatoes. 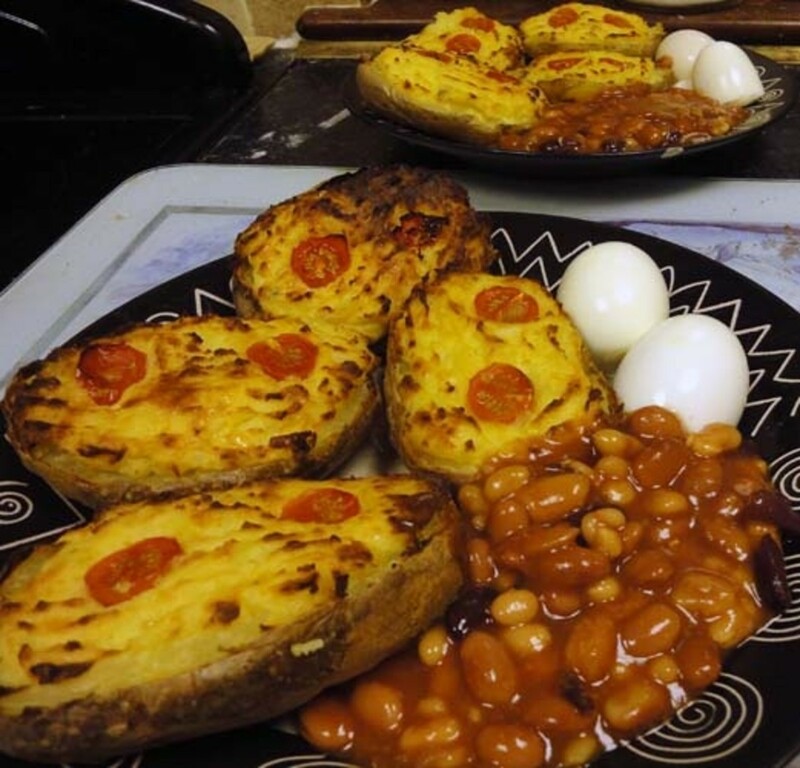 The stuffed jacket potatoes can be served on their own as a complete meal, or served as part of a main dish such as stuffed jacket potato and salad, or as shown in this article served with hard boiled eggs and baked beans. If you don't like onion then leave it out and just make it a potato cheese sauce. 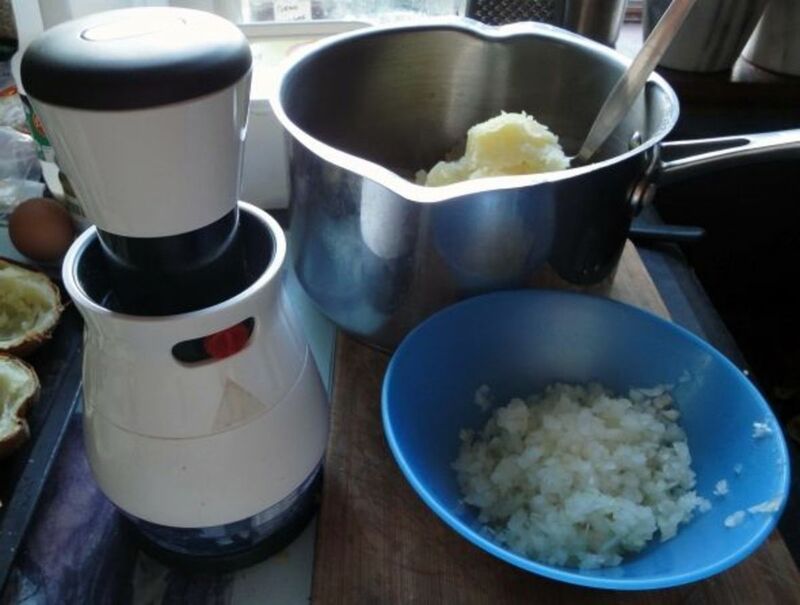 This is my own recipe for making potato cheese and onion sauce for baked potatoes. I recently came up with this as an alternative to bake potatoes stuffed with mashed potato and topped with grated cheese; following my experimentation in variations with cheese sauce recipes. Until recently, when I stumbled across a cheese sauce recipe in a 2nd world war cook book, I could never successfully make cheese sauce (it always turned out lumpy). The cook book for 2nd world war recipes gave useful directions for making cheese sauce which differs slightly from instructions in modern day recipe books and when tried enable me to successfully make cheese sauce; opening up a whole new world in cooking. The full instructions for making cheese sauce as revealed in the 2nd world war recipe book and my tips for variations in the recipe following my own experimentation are given in my article, 'ten healthier potato recipe ideas'. If you can make cheese sauce you can make this sauce mix; the ingredients and principle is very similar, the only real difference is that you use the surplus potato from the baked potato instead of flour as the starch for thickening the sauce and as the potatoes are already hot there's no preheating on the stove before mixing the ingredients. Clean, wash and partially bake the potatoes in their skins in the microwave until the inside is soft enough to scoop-out but not too soft, about 10 minutes; the potatoes are ready when a fork easily slips into them. When cool enough to handle, cut the potatoes in half and scoop out the interior; leaving about inch (12mm) potato around the outside to form hollowed out potato skins ready for stuffing latter. Place the scooped-out potatoes into a saucepan and add all the other ingredients e.g. margarine, mustard, herbs and spices to taste, onion, egg, milk and cheese. Mix all ingredients together and mash into the potatoes (to make the cheesy potato sauce), as you would when making mashed potato. 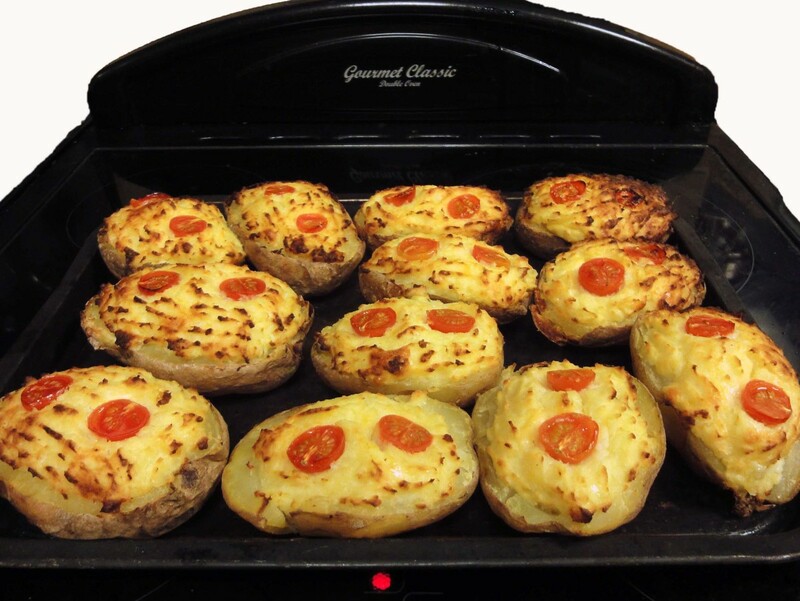 Fill each jacket potato skin with the cheesy potato sauce and optionally top with a thin slice of tomato. Place the stuffed jacket potatoes into the oven and bake at 200C (400F), Gas Mark 6 for about half an hour or until the potato cheese and onion sauce is a light golden brown. Once cooked remove from oven and serve immediately with hard boiled eggs and baked beans or on their own as a complete meal. 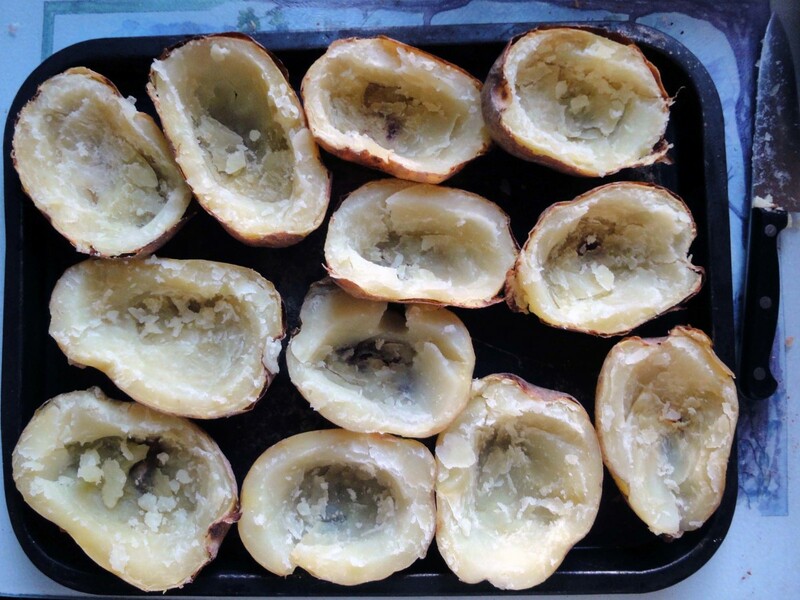 After potatoes are baked, cut in half and scoop out the potatoes to leave the skins. Mash the surplus potatoes, refill the skins, top with cheese and tomatoes. Bake in the oven until golden brown. Adding onion to the cheesy sauce is an optional extra for flavour and vitamin B; and can therefore be left out if you or your family don't like onion. This recipe for 'potato cheese and onion sauce' isn't restricted to just baked potato menus, you can use this sauce mix with a wide variety of other dishes including for example on its own as a tasty potato cheese and onion pie which could optionally be served with all your other favourites that you would normally have with cheesy potato pie e.g. mushy peas and veggie grills; fried eggs and baked beans; or even egg, chips (French Fries) and baked beans with cheesy pie. The possibilities are endless but to make as a cheese potato pie rather than a cheesy potato sauce to top a potato pie you would need to use less milk than you would normally do when making cheese sauce so that the mix is not too runny. This is a recipe you can have fun with in that you can vary the thickness or liquidity of the sauce mix by how much or how little milk you add in proportion to the amount of potato added; make the sauce as cheesy you like by varying the amounts of cheese added; and add extra flavour to the sauce by adding a range of cheeses rather than just one cheese and by adding various herbs and spices. The quantity and variety of cheeses you add will determine how cheesy and flavoured the sauce mix will be e.g. 100 grms (4 oz) of cheddar cheese with just a knob of stilton and a sprinkling of parmesan cheese will enhance the cheese flavour considerably. 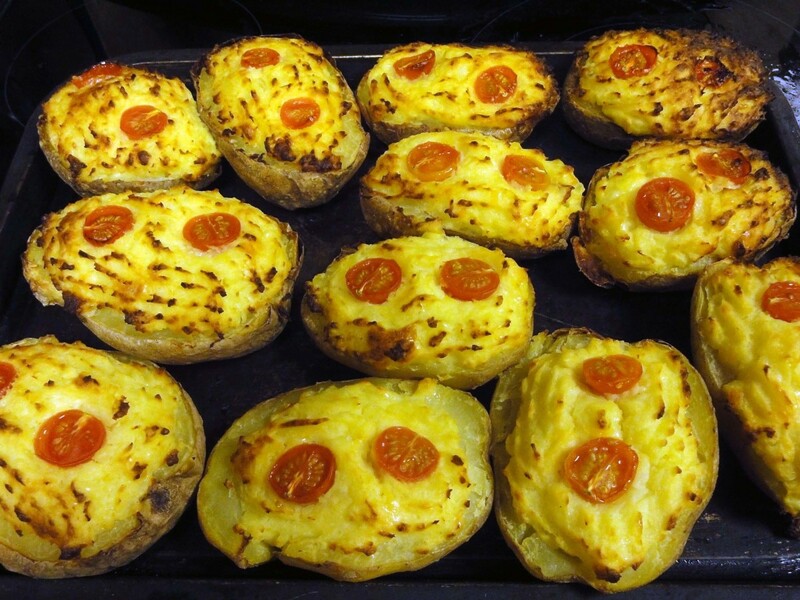 My favourite baked potato is baked potato stuffed with mashed potato and topped with grated cheese; this and other baked potato ideas are described in detail in my 'ten healthier potato recipe ideas' article. 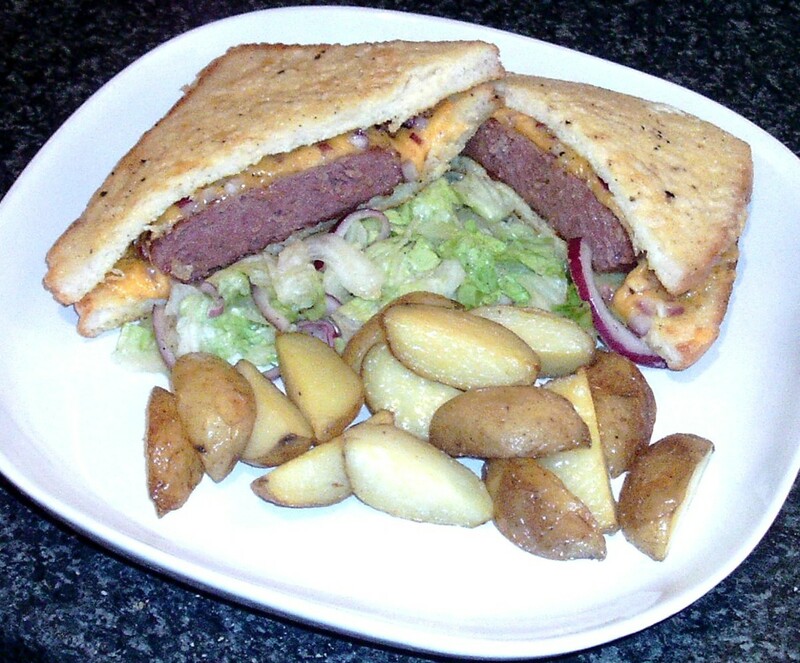 In making the stuffed baked potatoes featured in this article I was initially going to top the mashed potato in the baked potato skins with grated cheese when on second thoughts I decided it would be better to top it with cheese cause instead. Having recently discovered a recipe in a 2nd world war cook book for cheese sauce which I could actually make successfully (the secret is in the timing of the mixing of the ingredients). Then after further thoughts I decided rather than top the mashed potato with cheese sauce why not make the potato part of the cheese sauce e.g. one of the ingredients; and having recently done a lot of research into foods rich in vitamin B decided I would take it a stage further and add other suitable ingredients to the sauce (which I had to hand) that were rich in vitamin B including onion, egg and mustard. Following my research for B vitamins required by adults, B1, B2, B3, B5, B6, B9 and B12 and foods rich in these vitamins, which is covered in more detail in my 'Ten Healthier Potato Recipe Ideas' article, I decided I would make the cheese sauce for the stuffed baked potatoes featured in this article as vitamin B rich as possible. The subject of vitamin B is complex but in simple terms most recipes for cheese sauces are fairly rich in Vitamin B2, B9 and B12; and dependant on the cheese used the cheese sauces may also contain B5. It may also contain B1 and B6 dependant on any herbs used (includes dried herbs) and B3 if Paprika is added as an herb to the sauce. The other ingredients, all of which contain vitamin B, which I decided to add to this recipe of 'potato cheese and onion sauce' includes potatoes, onion, mustard and egg. The information given above is not comprehensive, it's intended for general guidance only as the ingredients mentioned above may contain traces of the other vitamins mentioned and cooking does destroy vitamins; so a reminder not to overcook your food for maximum health benefit. As an example, as well as containing high traces of vitamin B2 and B9 one egg also contains 6% of the daily requirement of B12 for one person. Cheese - Different cheeses have different trace levels of the vitamin e.g. 100 grams (4 oz) of Roquefort cheese has 34% of the daily requirement of vitamin B2, Parmesan cheese 38% of the daily requirement of B12. 100 grams of Swiss cheese has 17% of the daily requirement of vitamin B2 and 56% of the daily requirement of B12. Although from the research I did on the subject I did note that on balance the blue cheeses tended to have larger traces of vitamin B than other cheeses. Milk - contains vitamin B2, B9 and B12. Egg - contains vitamin B2, B9 and B12. Spices and Herbs (includes dried spices and herbs but dependant on the spice and herb used) may contain traces of vitamin B1, B2, B3 (Paprika), B6 and B9. Paprika also contains traces of B1, B2 and B6. Onion - contains vitamin B6 and B9. Margarine - dependant on the ingredients will contain various traces of vitamin B, and butter is likely to include vitamin B2, B9 and B12. Potatoes - contains B5, B9 and B12. As well as the vitamin B rich content of the 'potato cheese and onion sauce' given above the rest of the meal described in this article is also rich in vitamin B as detailed below. 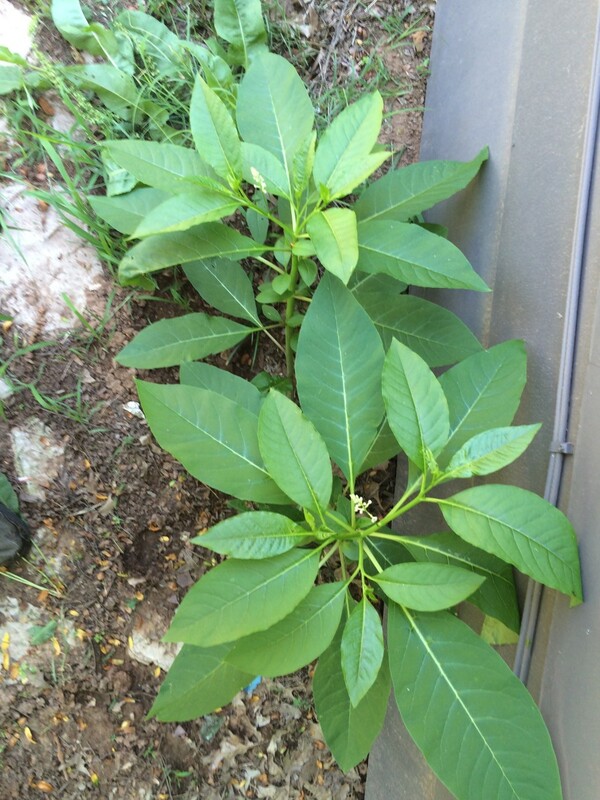 Again, as mentioned in the previous section, this is a guide only and is not exhaustive and the full benefit of the vitamin B described here is dependent on cooking techniques in that cooking food does destroy a lot of the vitamins in food. So you should never overcook your food if you wish to retain the maximum benefits of vitamin B. 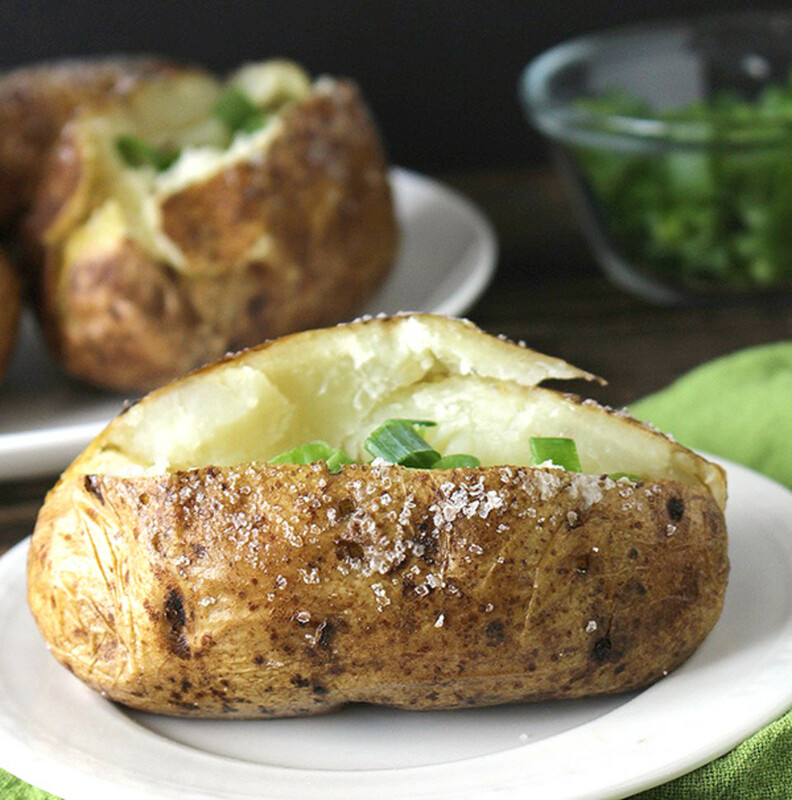 The potato skins in jacket potatoes is rich in vitamin B6. The potatoes left in the skins contain vitamin B5, B9 and B12. The tomatoes used to top the 'potato cheese and onion sauce' contains traces of vitamin B2, B3, B5 and B9. The hard boiled eggs served with the meal contains traces of vitamin B2, B9 and B12. The vitamins is in the egg yolk but as cooking destroys the vitamins there is less vitamin B in hard boiled eggs than there are in soft boiled eggs, soft poached eggs and sunny side up fried eggs. Beans are rich in vitamin B, various beans contains various high levels of vitamin B1, B6 and B9. Typically I would use baked beans which are high in iron, protein and vitamins including vitamin B. For this particular meal I used a tin of 'Five Beanz' which includes red kidney beans, haricot beans, pinto beans, borlotti beans and cannellini beans; all rich in vitamin B. 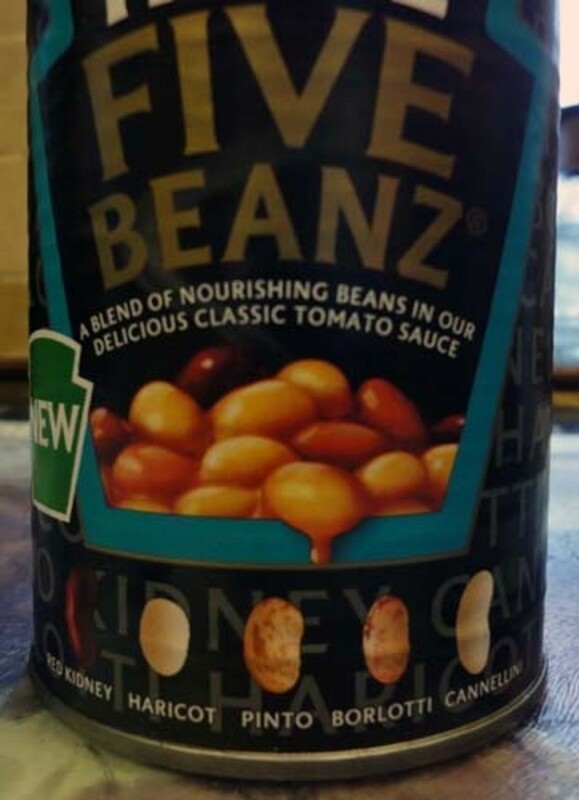 Five Beanz is a luxury item in that it is normally double the cost of the more traditional baked beans. However we buy it when on offer and stock up so that we can sparingly enjoy this luxury and nutritious bean product, without it costing the earth, as a special treat for meals rather than for day to day consumption. 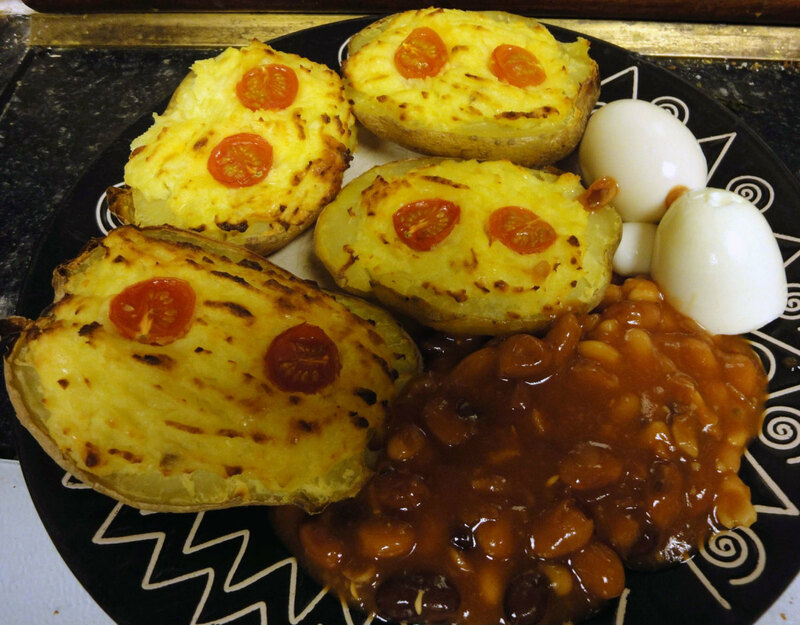 This is the full recipe for baked stuffed jacket potatoes, stuffed with potato cheese and onion sauce, topped with tomato and served with hard boiled eggs and baked beans. 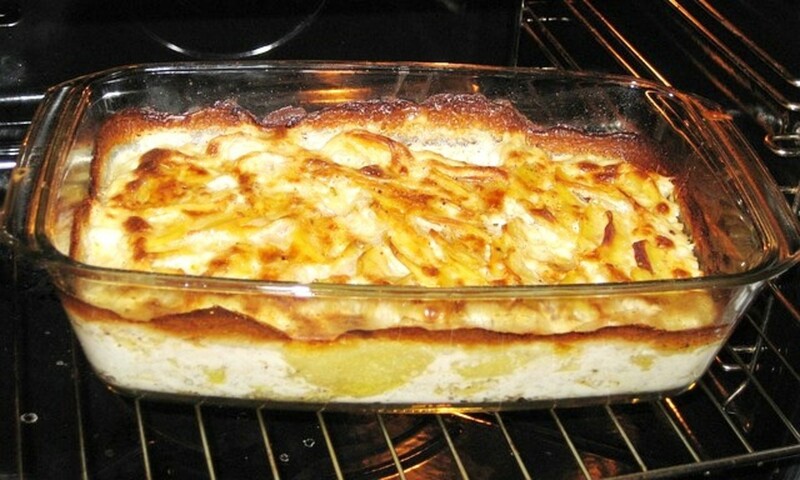 Potato cheese and onion sauce; ingredients and recipe given separately above. Wash and scrub the potatoes clean. 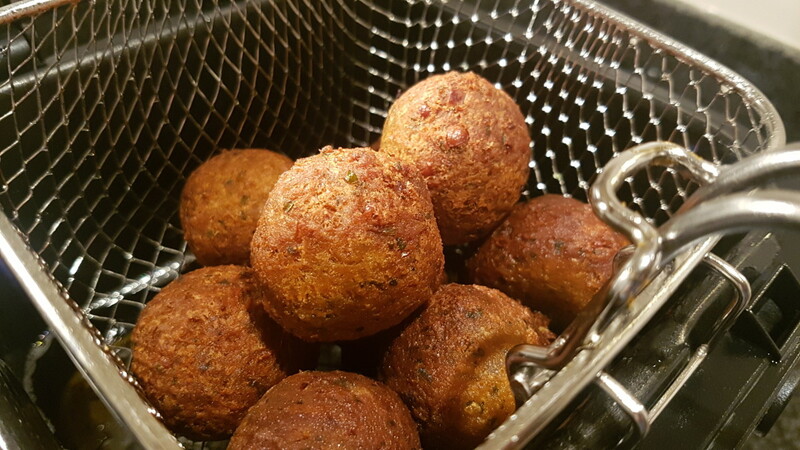 Pop the potatoes in the microwave oven for about ten minutes to partially cook, speeds up the cooking time so less time will be required baking in the oven; will also save on electricity. Put the potatoes on a baking tray and place in the oven for about an hour on full e.g. 240C (475F), Gas Mark 9. If you prefer your potato skins softer rather than crunchy cover with tinfoil or bake on a lower temperature for a longer period until the potato is soft through to the centre. After an hour test that the potatoes are fully cooked by prodding them with a fork; if the fork goes right through to the centre with no resistance then the potatoes are ready to remove from the oven. 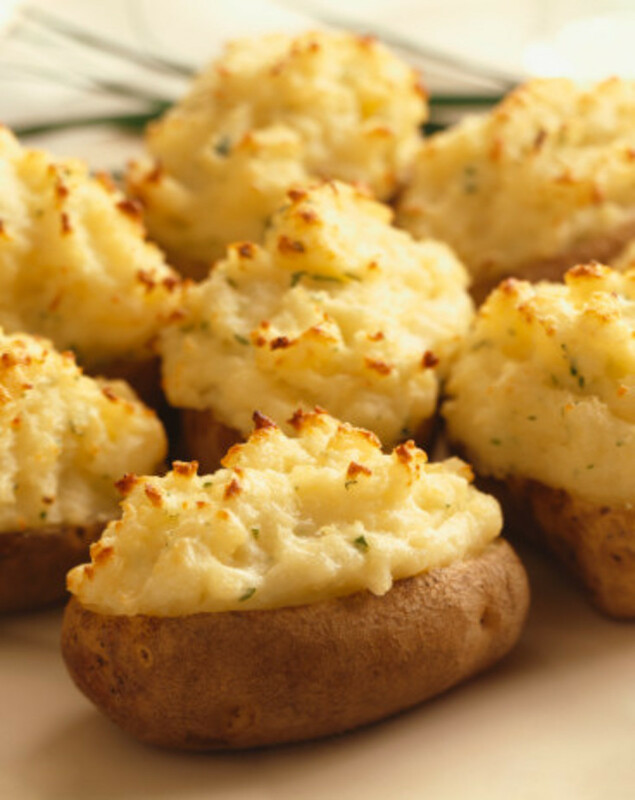 Once the baked potatoes are fully cooked remove from the oven and leave for a short period to cool a little. Once the baked potatoes have cooled a little (you may wish to use oven gloves to handle them) cut them in half and scoop out the centre, leaving about 1cm (half an inch) around the sides; place the scooped out potato into a large saucepan. Make the potato cheese and onion sauce, as described separately above. Using a tablespoon add a large scoop of the potato cheese and onion sauce stuffing into each baked jacket potato skin; add more as necessary to evenly distribute the potato cheese and onion sauce mix into each potato skin, and round off with the back of a fork. 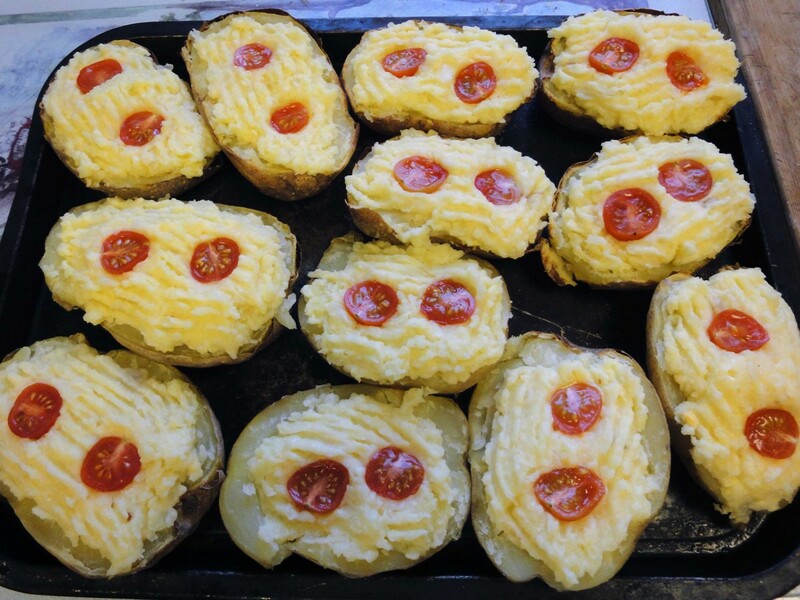 Cut a cherry tomato in half and push each half into the top of the potato cheese and onion mix; alternately thinly slice ordinary sized tomatoes and place one slice onto the top of each stuffed baked jacket potato. Place the stuffed baked jacket potatoes back into the oven to reheat on 200C (400F), Gas Mark 6 for about half an hour or until the potato cheese and onion sauce mix is a light golden brown. While the stuffed jacket baked potatoes are reheating hard boil the eggs; place two eggs per person into a saucepan and fill with water until the eggs are fully covered. Bring the water to boil and boil for seven minutes, turn the heat off and leave the eggs in the boiled water for about another ten minutes. Shell the eggs, using water from the tap to cool for handling if necessary, and place the eggs on the plates. 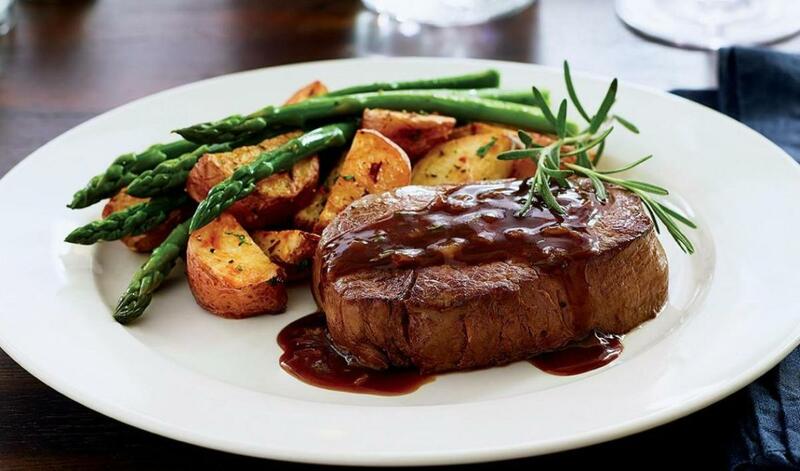 Once the stuffed baked jacket potatoes are cooked quickly heat up your baked beans, and while the beans are heating up take the stuffed baked potatoes from the oven and place them on the plates, shortly followed by the baked beans once they're heated and serve. I lightly simmer or steam my vegetables to maintain maximum goodness. I boil my vegetable to make them soft to eat. Thanks for all your feedback, all greatly appreciated. this looks scrumptious! Pinned it, in hopes of trying it really soon. Think I'll show this one to the resident chef - it looks yummy. Aforementioned chef (aka the hub) swears his way of preparing veggies is better than steaming: he boils the water first, and then puts the veggies in - apparently they cook very quickly and lose fewer nutrients even than when steaming. I don't know if that's true, but he makes very good veggies - just the right amount of firmness remaining. I confess to not always eating as healthy as I should but I'm making improvements right along and feel the better for it. That plate looks like a perfect meal to me and I'm wondering how you get your potatoes to smile....like I'm smiling now!